Fish beautiful Lake Texoma in a 23' Falcon Striper Boat. I am located on the Preston Peninisula north of Pottsboro Texas and fish out of Highport Marina. I provide Rods and reels, live and artificial bait are furnished. Your catch will be cleaned and bagged. I guarantee you friendly service and instruction to assure you a Quality, Safe and Memorable Fishing Adventure. You should bring a Lake Texoma Fishing License, Ice chest, snacks, drinks, wet weather clothing and life preservers for small children. For lunch you can bring your food and drinks or dine at one of our local restaurants or I can arrange shore lunches of either fish or barbecue are available for your group. Morning trips start at daylight. Afternoon trips start at 2pm. We will fish 5 hours or until a limit is caught and I will not rush you off the lake if we catch you limit quickly. Catch and release is allowed under most circumstances. 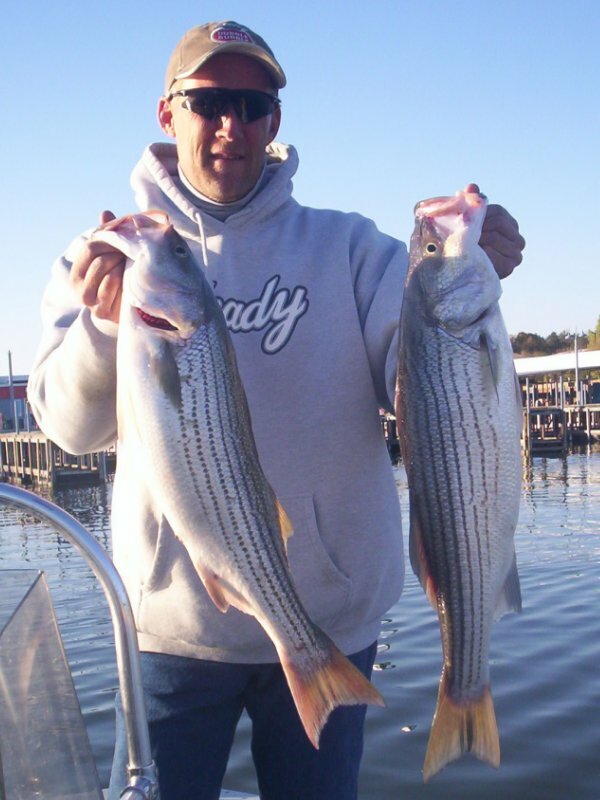 Daily limits are 10 Stripers per person with only two 20" or longer.